Today only, save $140 off the price of a new 8.9″ Kindle Fire HD or $70 off the price of a refurbished 8.9″ Kindle Fire HD. As its Gold Box daily deal, Amazon is selling the refurbished 9-inch Kindle Fire HD tablet at $129 for the model with 16 GB of storage. Brand new version of this tablet sells for $269 and the refurbished one normally sells for $199. This pricing makes it a great buy at the rock bottom price of the year, especially considering that newer Kindle versions are 6+ months away. The model in the offer comes with Amazon’s “special offers,” which are basically ads that show on the tablet’s lock screen and can be removed for an additional $15. Also, it comes with a USB charging cable. Now, if you were to ask me – I’m a big fan of refurbished models and I make use of them whenever I can. This is because they not only look like new, but carry the same warranty as the new ones. Amazon says it’s “certified to work and look like new” and carries the same one-year warranty as new models. 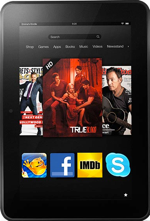 Our Amazon Fire HD reviews concluded that they are a great buy, especially if you consume a lot of Amazon content like music, TV shows, movies, e-books. It does not have an App Store which you can compare with the Apple App Store, but it has lots to offer. Again – lot’s to offer. Use this link and you may see a message that the item is unavailable. Click on Shop Now button and you will see the item is available in stock.